A strange game. The only winning move is not to play. How about a nice game of chess? I’m pleased to say that I upped my game somewhat over the past year, managing to churn out 62 posts in 2016, more than double the 28 posts I produced in 2015! There were a few other interesting trends over the previous year. The balance between VMware and other subjects has definitely shifted for me, where for example, I wrote well over a dozen posts on AWS. 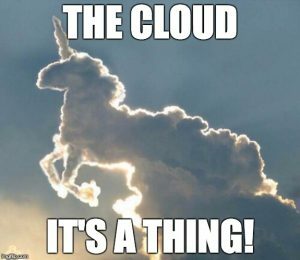 I guess this is probably representative of both my recent role change, as well as the shift in my customers from being 90%+ VMware houses, to a broad mix of different cloud platforms, both public (AWS / Azure) and private (VMware / OpenStack). This trend is only going to accelerate in the future, and I suggest Scott Lowe’s Full Stack Journey podcast would be well worth your time subscribing to for great information on how to avoid being left behind as our industry morphs over the coming years! It’s worth noting that this trend is also mirrored in the top 5 articles alone, which include popular newer technologies such as Docker and AWS. That said, it’s great to see the Intel NUC Nanolab series is still as popular as ever, and people are obviously still keeping their vSphere skills and certs up to date, based on the VCP delta study guide popularity. You may also have noticed that I have been a little quieter of late. The main reasons for this have been down to starting my new role earlier this year, studying for exams, plus a number of other projects I’ve been involved in (such as the Open TechCast podcast). Hopefully I can find a little more balance between them all in 2017, though I already have a couple of podcasts, a VMUG presentation, and a possible exam lined up for January so I’m not really helping myself on that front! So, enough jibber jabbing! Here follows the top 10 most popular posts of the past 12 months. My Synology DSM Blue LED issue was actually just a failed drive! Something Mike Preston and I discussed on our recent Open TechCast podcast episode, was how it can be a little frustrating as a blogger that often an opinion piece which took ages to write and edit will get a small number of views, whilst a quick tip which took a couple of minutes to jot down, might get thousands or even tens of thousands over time! Anyway thats enough from me for now; all the best for 2017 folks! The regularity with which my posts are likely to feature Docker or other container technologies is increasing quickly, so I thought it was worthwhile indexing all of the current posts and providing an updated list as this grows. Hopefully, this should make them easier for people to find! 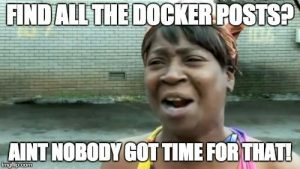 Very cool stuff about Docker, Photon, and running DOS in containers! An array based on containers? It’s like storage for millenials! Startup spotlight on StorageOS – a new container based storage platform. 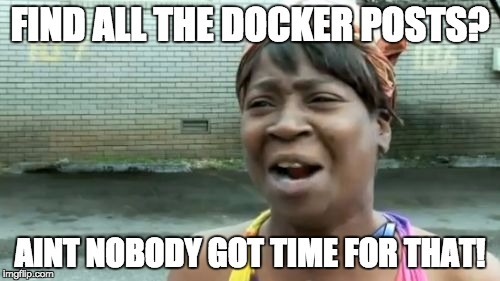 If you’ve been following this series (last part here), we now have docker installed, but what do we do next? Create our first containers of course! The good thing here is that all of the above steps are repeatable with whatever application you wish to install inside your containers. This is just a simple way to help get your head around the concepts and commands. We start by creating our first empty Ubuntu container. The –i connects us to the shell of the container (interactive). Then in this case we need to install the python and web.py dependencies INSIDE of the container. This could be modified for any required dependencies or apps. $ sudo docker run -d -p 8081:8081 fcb365f7591b python /home/test1/app.py 8081 "instance1"
$ sudo docker run -d -p 8082:8082 fcb365f7591b python /home/test1/app.py 8082 "instance2"
$ sudo docker run -d -p 8083:8083 fcb365f7591b python /home/test1/app.py 8083 "instance3"
Try the same for the other two port numbers. Note we now have a system running 3 separate containers which could then be load balanced using a third party tool, or even run completely different content. Cool huh? So that’s it, finito, over, done! Day two of SpiceWorld London is officially closed, and we are all left contemplating what we’ve learned, the new acquaintances made and how we are going to use the information we have learned over the past couple of days to influence our jobs and careers moving forward. With the removal of the marketing track and most of the main hall sessions, today was a quieter, more tech focussed event than Tuesday. The more subdued atmosphere may also have something to do with last nights party of course… That said, I saw significantly more discussion and interaction at the sessions I attended, which always makes for a more engaging event. I was able to catch 4 sessions on a variety of subjects including cryptography, Windows 10, certification and a session on the SpiceWorks community, and what they’re developing. The first (and most well attended) session of the day was on all of the new improvements and features in Windows 10. Two of those features in particular stood out to me, one of which generated some (rather heated) debate in the room! The first feature which rather concerned me was around the potential privacy issues with Cortana. There have been a number of fairly high profile privacy issues with recent editions of OS X and Ubuntu, yet Microsoft seem to be quite happy to have joined in. Many smarter people than me have articulated the risks of the direction in which our industry is headed when it comes to privacy! The feature which actually generated the most debate in the room was around the requirement to have a Microsoft Account in order to use the features of Cortana, and the subsequent impact it may have when user’s either want (or don’t want) to use their personal accounts to enable this feature on their corporate devices. Undoubtedly this would be Microsoft’s preference as it enables them to build up a more accurate profile of you from the data collected in both halves of your life (tin foil hats at the ready people!). The alternative of course if for users to maintain two separate identities with MS, for example based on their corporate email. This then has the potential to lead to confusion for users, and additional work for the IT department who most likely have to setup and support these accounts, in addition to everything else they have to manage. There were some fairly strong opinions in the room to say the least, and the atmosphere got pretty tense at one point! One of the reasons for using contractors is that they help you to fill skills gaps. If you have a team full of contractors, and you don’t have the right skills available, you’re doing contracting/outsourcing wrong! Yes, contractors earn more and pay less tax, but they need to fund their own holidays, and more importantly, their own development. It’s not all roses! If contractors are not willing to invest in their own skills, why would an organisation want to hire (or in this case renew) them? My final key takeaway from Chris’ presentation was something which I intend to make my life’s goal; maintaining the grooming standard! Reflecting back on the past couple of days I would say that you are in of a first or second line IT engineering role, perhaps working as the sole IT guy in an SMB, or even as an IT manager, then the Spiceworld conference is definitely worth checking out! There are a wide variety of sessions on different areas of IT and you can dip in and out of subjects depending on your interests. You can also take this one step further by attending your local SpiceCorps meet up. If you want to go that bit deeper dive, then on you might want to consider either alternatively or additionally attending some of the more vendor focussed user groups such as VMUG or CitrixUG, and if talking to tech marketers is your thing, there are plenty of them at the massive vendor agnostic events such as Cloud Expo and Apps World.